At times when I am busy with work, I will need some quick games to relax in between. 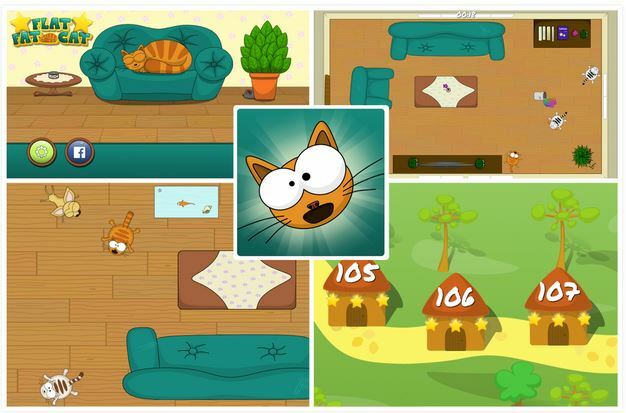 FlatFatCat – Funny casual cat game by Rainware is one such game which can be played whenever you get a little time out of busy schedule. 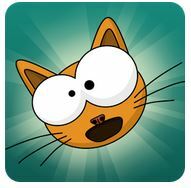 The design of the game FlatFatCat is very neat and beautiful. The bright coloured aesthetics with the cartoonish design of the characters makes the game a good pick for younger ones as well. The animations in the game are very smooth. The soundtrack is also fun to hear as it blends very well with the game. The controls in the game are responsive as well. 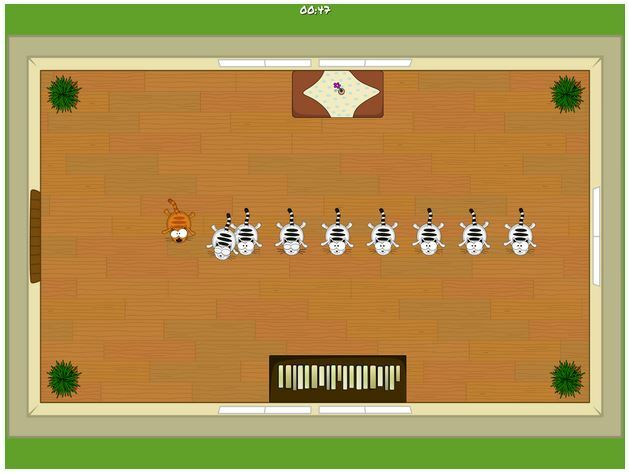 The game FlatFatCat is level based. There are hundreds of levels and the level designs are magnificent, adding thrill and challenge to the game. In FlatFatCat Bruno the cat is on his journey to bring more joy and fun into his life. 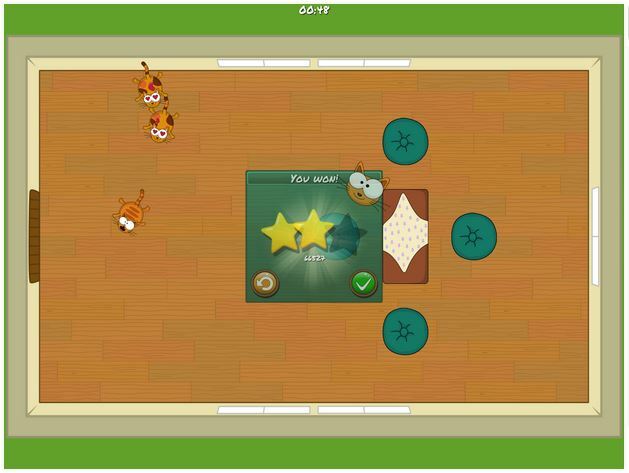 You have to help Bruno solve puzzles by pushing him just like in billiards or air hockey and bringing color – fitting cats together. 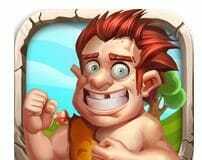 The game looks simple but challenge and the thrill increases with levels. Every room offers a diversity of obstacles, from simple furniture to dogs and fans up to color buckets! The main goal of the game is to bring together all same-colored cat pairs. But Bruno dislikes dogs in general, but Chihuahua are a special treat for him. Their craziness is unpredictable. This is why they reject cats. There are many other obstacles in the game with which Bruno has to deal with. The fans which produce a lot of wind and rejects cats if they are not fast enough. Bruno´s owner is an ambitious artist and thus has some color buckets lying on the floors. Bruno has a lot of fun bouncing cats into the color. His wife on the other hand is a florist, and her flowers are standing on the floor and you are not supposed to crash into the pots. 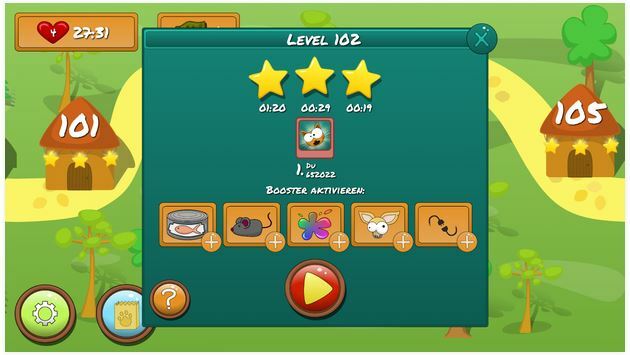 Each level in the game has 3 stars. The faster you are, the more stars you get. Its been a week I started playing this game and whenever I get a little time I keep coming back to it. I highly recommend checking this funny and challenging game. Clear all the levels as fast as possible to reach the high score. You can play through Bruno’s adventure on your own or with your friends and compete with them. Previous articleVivu – Remote screen for YouTube By PanWide Ltd.